BSQ Solar participated in project ASES (Smart high efficient Alternative Solar Energy Source) in collaboration with two other industrial European companies, Eryma from France and Elceram from Czech Republic and with the support of two research centers, the University of West Bohemia and Tecnalia from Spain. The main objective of the project was the development of a portable, plug & play and highly efficient, solar electric generator for standalone applications. The system is based on an HCPV generator with total power in two variants, 180W or 360W. It is also equipped with a battery pack and a charge controller to ensure optimal power supply, as well as a wireless communications module with its associated man-machine interface for handheld devices, to enable the remote control and monitoring of the system. Research carried out by Eryma’s marketing department, foresees a market opportunity for medium sized stand-alone generators (100Wh/day to 1kWh/day). For example, and according to public data from independent market research consultancies, every year more than 20 million surveillance cameras are sold in the world and few hundred thousand in France only for transport, military, industry, or security applications. It is the fastest growing market in the field of electronic security, in which France alone has a market value of over 1 billion euros. It is considered that about 10% of these applications can improve customer’s satisfaction and functionality by using a renewable energy stand-alone generator. 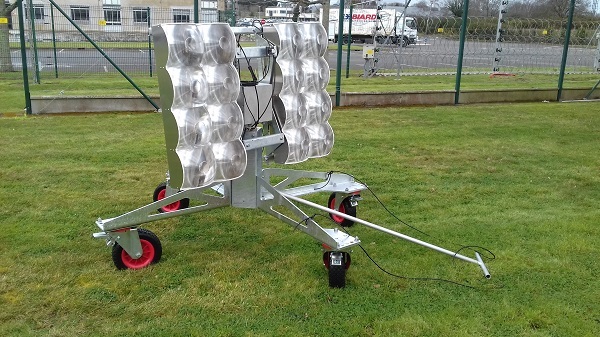 An essential part of this system has been the design by BSQ of a low cost, portable HCPV sun tracker to host a modified version of its standard HCPV modules. This has entailed the design of an integrated sun tracking mechanical drive and controller, based on compact gearings, electronic sensors and electric motors, all controlled by custom made electronics. The complete system can be quickly assembled and compactly packed to enable portability.